The island of Santorini resulted from a violent volcanic eruption millennia ago. Consequently, the earth is gray or black volcanic ash and looks dead. But, the ashen lava is the secret ingredient of Santorini’s wine success. The Cycladic vine is circular and lies in a depression in the ground to protect it from the strong Aegean winds. 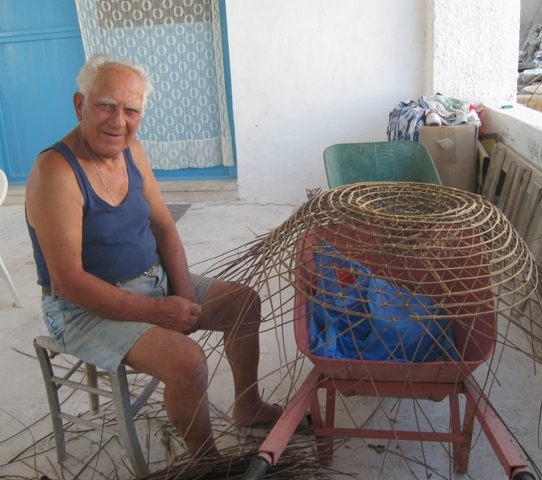 New shoots are woven around the stump in the shape of a basket or wreath, a clever technique allowing water, a scarce item on Santorini, to collect from nocturnal fogs. This Santorini fisherman lives on the island of Thirasia, population 270 inhabitants, in the tiny settlement of Riva where ferry boats dock, discharging mostly locals. Foreigners visiting Thirasia usually bypass Riva in favor of the more touristy Korfos, stopping for lunch on a sailing excursion to the caldera hot springs.